Fact about civilwar, names and politics. 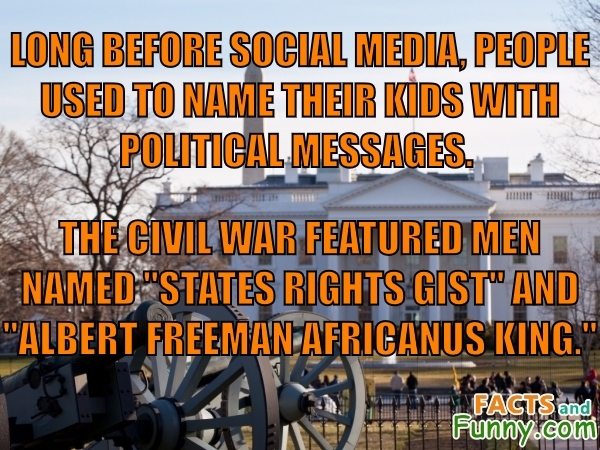 Interesting fact about civilwar, names & politics. Long before social media, people used to name their kids with political messages. The Civil War featured men named States Rights Gist and Albert Freeman Africanus King. In addition to civilwar, this photo shows the white house, trees and a cannon. Ulysses S. Grant was born Hiram Ulysses Grant. This content was created in February 2019.